Parabit showcased its Virtual Concierge digital signage kiosk for use in the hospitality and retail industries, one that meets the needs of both the user and the business needs. Interesting to see if people will stop to engage with this user interface – seems rather like things we have seen fail in the past – wonder what will be the compelling use cases? Another example of the shopping approach we pioneered in 2007 called Social Retailing which combines the social networks with the physical stores to enable shoppers to connect with their friends in real-time. Read more about the solution developed by digital signage OmniMirror from Australian software company 5 Faces. Maybelline NY new interactive campaign is very experiential and connects shoppers from around the globe. 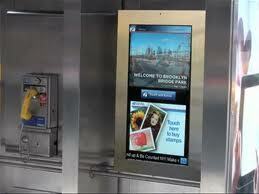 It combines digital out of home, social media & real-time video. Maybelline’s campaign invited Russian female citizens to submit three photos of themselves using a dedicated Facebook app. The photos are turned into a short personal video that’s featured on one of Clear Channel’s billboards in Times Square for a chance to win a trip to New York. Passersby in Times Square are invited to vote for their favorite contestant on Maybelline’s website. The person with the most votes wins. In addition to broadcasting the campaign live in Times Square, participants based in Russia are able to track what was happening on the billboard live 24/7 through a livestream video. Maybelline NY – Win New York at a Glance campaign (3) from Vlad Sitnikov on Vimeo. 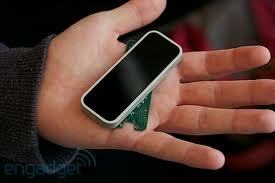 Check out project 24/7 which is a revolutionary communication system designed for the 21st century. Interesting use of the space once occupied by pay phones. Here is a link to the User Experience. Clever campaign that plays well to the context of the audience. “Daffy’s advertising campaign shows consumers what an 80% off discount really looks like. To demonstrate it they combined vivacious, scantily clad models with interactive digital signage. Pedestrians start the Peep Show by placing the palm of their hand on a motion sensor connected to the street-level window display. The digital curtain rises and the fun begins, revealing what they look like with only 20% of their clothing left on. Yes folks, the striptease is back (in Times Square)!” Read full article. 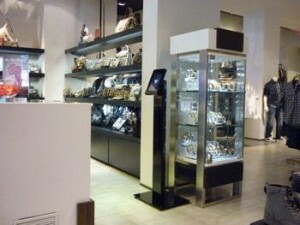 Lifestyle apparel brand Guess is arming stores with iPads to enhance the overall shopping experience and generate additional sales. The iPads are mounted on rolling stands that serve as self-service kiosks to Guess’ online resources for a wider product selection. Store associates can also roll the self-service kiosks into dressing rooms to visually display options and accessories to shoppers. Within the store, the application allows shoppers and store associates to browse various styles via the LookBook functionality and to select products for either immediate purchase or order online if the product is not available in the store. After hours, the iPad is set up to deliver training videos to store associates and managers. Guess has also deployed the iPad solution to it outside store activity including some events, including the recent Jingle Ball at the Staples Center in Los Angeles, and on a 6-week road show in Asia. Guess currently has iPads use in a dozen stores in the United States with plans to roll them out to additional locations this year. See my prior post 5 Examples of Mobile Apps for Employees. Body scanners have been around for a long time, for example the one used by Brooks Brothers in combination with a custom pattern making system to create individualized suits. Apparently the technology is getting more affordable. In this version you can control the scan yourself which might remove a previous barrier to adoption – some women are not comfortable with someone seeing a digital image of their body. Perhaps when combined with apps like the one for the Kinect you will be able to try on clothes just for you from your home which adds additional value. Manufacturing’s share of the total private U.S. workforce has shrunk while output has doubled because of technology. 3-D printing looks like manufacturings “shiny new object” and is poised to create a paradigm shift that could be quite disruptive. 3-D printers can create replicas of objects – even ones with moving parts. It enables flexibility and agility in the design processCheck out this fascinating video below and read this Forbes article on the uses and implications of this technology.